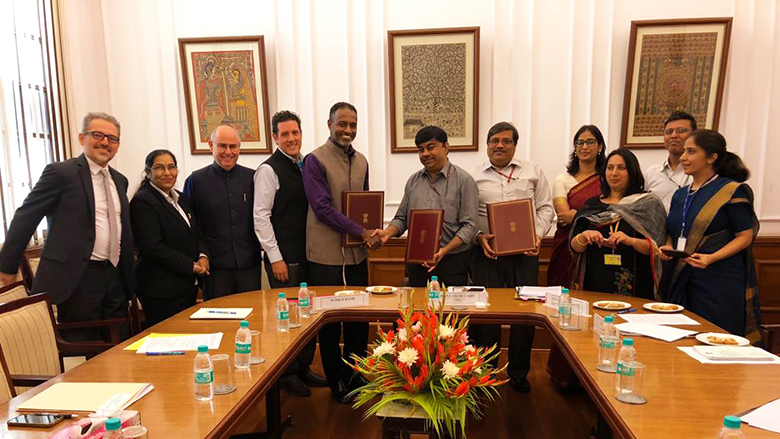 Government of India and World Bank Sign Agreement to Invest in Technology that Addresses India’s Public Health Priorities. The $125 million (833 crore INR) loan from the International Bank for Reconstruction and Development (IBRD), has a 5-year grace period, and a maturity of 19 years. The Objectives of the project is to nurture indigenous innovation, foster local product development and accelerate commercialization process by bridging critical skill and infrastructure gaps to promote affordable and innovative healthcare products generation for inclusive development and increasing competitiveness in India. The project would support consortia of public, private, and the academic institutions to overcome the key market failures currently holding back the development of an innovative biopharmaceutical and medical devices industry in India. (iii) Project Management and monitoring & Evaluation. The Innovate in India for Inclusiveness Project will support Government of India’s Biotechnology Industry Research Assistance Program (BIRAC), set up five years ago to support innovative start-ups and collaborations through strategic partnerships. This project, will nurture next generation technical skills; provide companies with advanced shared facilities to conduct clinical validation; link clinical trial sites with networks of expert advisors and international bodies; and strengthen all institutions involved in the facilitation and adoption of global innovations, technologies, and licensing models.